Genre: Adventure, fantasy, folk tale. Related Series: Original fairytale by Hans Kristian Andersen. Also Recommended: Princess Tutu, Castle in the Sky, Kiki's delivery service. Notes: Based on an old folk tale by Hans Kristian Andersen. Once upon a time, two friends lived together, sharing a strong friendship symbolized by two roses, one white -- Kai's favorite color -- and one red -- Gerda's favorite color. The two have been friends since childhood, a bond that only seems to get stronger every day. 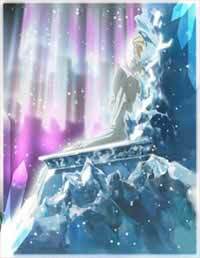 However, in the Snow Queen's castle, through circumstance or plan, the queen's mirror is broken into a million tiny shards. During this winter as the children are playing outside, one of these fragments gets lodged in Kai's eye, immediately making its way to his heart. Because of this, Kai grows more distant, cold and aloof every day. And after a particularly bad day that ended with Kai smashing the pot where the two roses rested, he's taken away by the Snow Queen to her castle. As noone saw this happen, the entire village believes him dead, save for Gerda. Not willing to give up on her best friend, she sets out on a journey to find him, wherever he may be. Once upon another time, a Norwegian citizen looked upon this title with a curious eye. While he had not read the original tale by Hans Kristian Andersen, a Danish writer and poet, he wasn't entirely unfamiliar with old, Scandinavian folk tales in general. Among the surprisingly generous selection of said tales actually having gotten Japanese animated works to their names, few -- if any at all -- have seen release outside of Japan, and this is sadly the case with Snow Queen as well. Directed by Osamu Dezaki, Snow Queen runs a full 36 episodes, a veritable epic at that, and remains one of my favorite animated works of all time, especially now that I've had the chance to watch the entire thing. The sheer scale of the story is quite telling in that it takes the fourth episode for Gerda to start her journey at all. Snow Queen literally establishes the hell out of itself. But don't be tempted to assume this is because the show can't pace itself well -- it literally needs three episodes just to set up its main character's drive and force of will. Our main female protagonist is, after all, setting out on a journey few adults could match, even less so children. And yes, she does get some outside help, but not so much that it feels like she's beeing carried through her journey -- far from it -- but in her travels, she meets and bonds with quite a few people, and they help each other out in turn. A little later in the story (a few episodes past my initial stopping point ahead of the first review) she meets wandering minstrel Ragi and his dog (wolf?) companion Holger, whose name he received from Gerda on their travels, and through a pretty touching episode story at that. On the subject of Gerda herself; some of our female readers out there might actually appreciate the fact that Snow Queen tells a story about a woman (well, girl) who sets out to rescue her male friend for once. In fact, her tenacity, yet gentle and friendly heart makes her at least an equal to the many female Studio Ghibli heroes we've seen in their movies, and her interactions with the many people she meets is what makes the story so endearing. And Snow Queen managed to instill all these positive qualities in her without being too obvious or blatant about it, which was maybe the main reason why I had a bit of a problem taking Nausicaa as seriously as I probably should. As for the titular Snow Queen herself, she's not a true villain, not even in the original story, but her role in the anime is still probably more involving than in the original tale. She seems cold and aloof most of the time, and, as Gerda learns when she meets Ragi; he has a bit of a bone to pick with the queen of the dancing snowflakes. The show does make it clear that she brings Kai to her castle mostly to save his life, but even outside of that, there's always the feel that she does what she has to for the sake of her castle and the residents in it, but also the land in general. Ragi, whom Gerda eventually meets and becomes another travelling companion for, has his own grievances. Aside of entertaining people in the towns they reach, he's also on a trip to visit the relatives of the soldiers who used to be under his charge before they were all wiped out during a snowstorm. (Hence his grievance with the Snow Queen.) But even before we learn his backstory, some people might already have figured this out, seeing as he's as taciturn and duty-driven as a soldier tends to be. Even his songs have this curiously monotonous tinge to them, coming more off as recitals of poems rather than music for music's sake. His qualities makes him a good team partner for Gerda, and the two build a strong bond for the time they travel together, which is also the point where Gerda gives his white, furry travelling partner his name. The art style isn't specifically... "anime" as the traditional style goes. Instead, most of the characters seem to float between a more European style, while some of the men, Ragi in particular, seems more modeled after something you'd see in a Leiji Matsumoto title. All the kids are round-faced, rosy-cheeked little scamps, and the show occasionally ventures into children's book surrealism though its more bizarre episode plots, which actually suits something based on old folk tales quite well. (Trust me; I've read quite a few old Norwegian folk tales, and they can get pretty strange at times.) Osamu Dezaki's penchant for pastel painting fadeouts, or "postcard memories" as he called them, fits the show like a well-worn glove, particularly in light of the spectacular backgrounds this show often has during the more amazing moments of Gerda's journey. I once wrote that I still had a long way to go with this show, which actually turned out to be a bit of an understatement. Aside from one recap episode, Snow Queen has held an admirably steady pace, never once becoming boring or making me want to watch something else, yet filling me with the kind of urgency to make me want to see this through. And now that the journey is over, I can say with conviction that the show does just as good a job ending as it does seeing us off; by making a proper conclusion and actually going those few extra steps by wrapping various elements of the show up. And that's why this show is going to remain one of my favorite shows of all time. Its somewhat archaic (and old-fashioned) art style and storytelling might not appeal to everyone, but those who aren't afraid of some vintage stuff -- even if it's somewhat recently produced -- will feel immensely rewarded by Snow Queen. Recommended Audience: Despite having little to no violence to speak of, Snow Queen doesn't necessarily pull its punches. There's the part with Ragi's men who dies in a blizzard, plus various other more serious story elements, some sadder than others... like how Snow Queen adapts another short tale; The Little Match Girl.